The Faculty of Arts has awarded Bachelor of Arts (Honours) student Greer Clemens with the 2018 Melbourne Writers Festival (MWF) Creative Writing Prize. 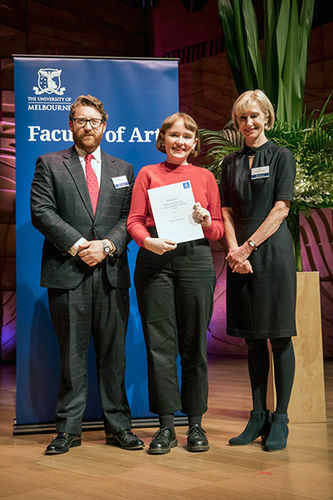 The prize is the result of the partnership between MWF and the Faculty of Arts at The University of Melbourne, which celebrates and supports new creative writing talent. The prize includes $1000 and an all-access Premium Pass to this year's MWF. We asked Greer a few questions about the prize and her plans for the future. What's book is currently nestled on your nightstand? At the moment I'm mostly reading for my thesis and coursework, so this week I'm looking at Frank O'Hara's poetry and reading Maggie Nelson's chapter on O'Hara, John Ashbery and James Schuyler in her book "Women, The New York School, and Other True Abstractions". What's your perfect writing environment? Natural light, a chair with a back, and some music without words or background noise. I like writing essays in the library, but it's harder to write poems or scripts there. What gets your creative energy flowing? Mostly I want to write if I've read something great, or seen a great play or movie. When I saw Eileen Myles speak a few weeks ago they said not to be afraid of emulating the writers you love, which was reassuring! I also feel like I get really sucked in by changes in the weather, even though I don't usually write about nature - I think when the weather is changing it can make you more aware of your surroundings. What piece of advice would you give to aspiring creative writers? I feel like I still need all the advice I can get! In First Year I ran into a writer I admire in a public bathroom and she told me it was fine that I didn't like Bukowski and not to settle with a teacher I didn't find inspiring, which is wisdom I've definitely held onto. What are you most looking forward to at this year's MWF? Listening to writers speak about their work. I always like hearing interesting people talk about their craft, and I love waiting in line to have a book signed. I’ve found that if a teacher is great then their subject is too, so I loved Encounters with Writing taught by Dr Hayley Singer, Hollywood and Entertainment taught by Dr Dan Golding, and Poetry and Poetics taught by Dr Chloe Wilson. I also took Indigenous Art and Changing the Nation, tutored by Rheannan Port, in the Australian Indigenous Studies program as my breadth study last semester, which was amazing and made me wish I'd taken AIS subjects for my whole degree. I loved working in The University of Melbourne archives last year in Encounters with Writing, so I'd love to do another archive-based project. What will you do with your prize money? It will probably go towards buying books and snacks that'll help get my thesis written! I also have a feeling I'll fail my first driver's license test, so maybe it'll pay for a couple of attempts. To finish Honours and save to go to Europe next year!